(…continued) These words of Jesus are all about being connected. Jesus uses the image of branches being connected to a vine. 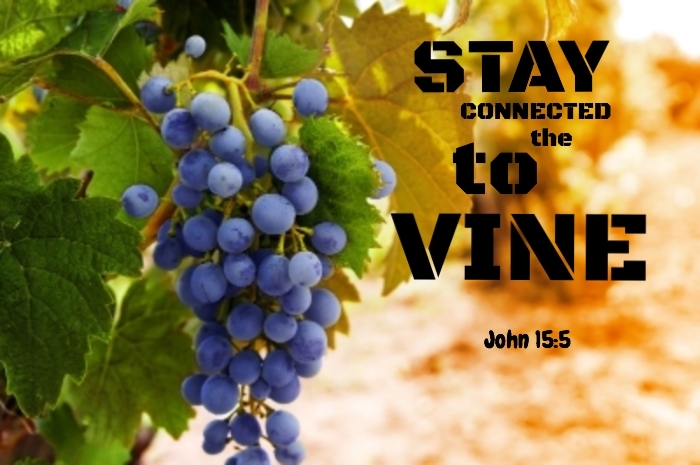 He describes himself as the vine, and we are the branches that are connected to him. There is both a promise and a command in this image. The promise is this: God has made you, he has given you your life, he sent Jesus to save you from your sins, and he has promised you eternal life in his heavenly home. God has, in Christ Jesus, connected your life to his. “Abide in me,” Jesus says. The word ‘abide’ appears eight times in these eight verses. The word abide, or, ‘remain’ in some translations, implies that we are already there, already with God. “You are my friends,” Jesus will say a few verses later (v. 14). Jesus is not inviting us to take hold of something, he is not telling us to work toward a distant goal, he is not holding out something for us to try to attain. He is describing a relationship already given. “Abide in me,” he said, asking you to remain in the relationship he made with you. In C. S. Lewis’s image of hell, everyone is free– and they use that freedom to get away from everyone else. Their suffering is in the loneliness that they have freely chosen. Jesus one time said, “You did not choose me; I chose you.” What we need most in life are connections, these relationships, and Jesus here says that the most important connection is already taken care of; we are connected to God— if we will allow it to continue. So now, says Jesus, “abide in me.” That is a promise, and it is also a command. Abide. Remain. Stick around. Keep in touch. Do not betray, desert, abandon, forsake, ignore or trifle with the God who has given this relationship to you. Stay connected to Jesus. How do we do that? Well, in all the old usual ways– by prayer and Bible reading and worship. Do you have any other better ideas? The weekly Sunday morning gathering isn’t just something to do if there is nothing else going on. It is by this connection with God that we have received life itself and the promise of eternal life. “Abide in me,” says Jesus. Weekly worship is the way people have been ‘abiding in Jesus’ throughout the ages. Even Jesus went to worship, ‘as was his custom’ (Luke 4:16). This is how we keep alive the relationship that God gives us and stay connected, until the time comes when we are with Jesus in person. Do not severe that connection, Jesus commands, because “If you do not abide in me, you will wither” (verse six). Branches that are connected can receive nourishment and life, and will thrive. But the branch that is cut off receives no nourishment, and cannot survive.